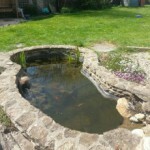 Stephens Industries has many years experience of installing liners for ponds, lakes, swimming ponds, lagoons and reservoirs. We believe strongly that synthetic rubbers such as Firestone and Elastoseal EPDM are the best materials, as they are the most cost effective over the life of the lagoon liner, typically 40 years. Cheaper materials are available but they have a much shorter life expectancy. As part of our service, we undertake site surveys to ensure that the lagoon is properly prepared, to discuss the material options, measure the site accurately and review any special design and construction details such as sealing around pipes. On agreement of all the details, our specialist trained team will install the liner, with ISO 9001 certification. 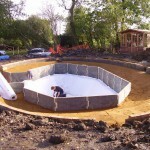 We aim to prefabricate lagoon liners as large as possible in our factory to minimise the number of site joins required. 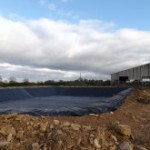 In some situations we can supply the liner as a single sheet; however, in many cases we manufacture the lagoon liners in a number of panels to ensure they are still easy to handle on site. The actual quantity and sizes of sheets depends on factors such as the shape of the lagoon, the steepness of the banks, access to the site etc. Our installers are fully trained and qualified in Firestone, Elastoseal EPDM and other specialist materials, and work throughout the UK. We believe passionately that Quality and Experience matters, so if you require a dedicated team to help you complete your project on time and with a quality finish, please contact us for a discussion.